In a large mixing bowl, whisk together flour, sugar, baking powder, and salt. Stir in almonds. In a small bowl, whisk together eggs and almond extract; stir into flour mixture. (Dough will appear very dry but will come together when kneaded.) If the dough will just not stick together, add water one tablespoon at a time until the dough just stays together. The dough will be very sticky, so have your surfaced floured and baking sheet ready before you start to knead the dough. Transfer dough to a floured work surface; knead until smooth. Divide dough in half; shape into two logs, each about 1 ½ inches high and 2 ½ inches wide. The logs will spread out a little, so keep this in mind. Place on a parchment lined baking sheet (or silicone mats), and sprinkle with remaining sugar. Bake the logs until they are puffed and outside is firm (the tops may crack), about 30 minutes. Transfer to a wire rack to cool completely, about 2 hours. Using a serrated knife, thinly slice the logs crosswise, 1/4 inch thick. Lay slices on two parchment-lined baking sheets. Bake until crisp and lightly golden, rotating pans and turning biscotti over halfway through, 20 minutes total. 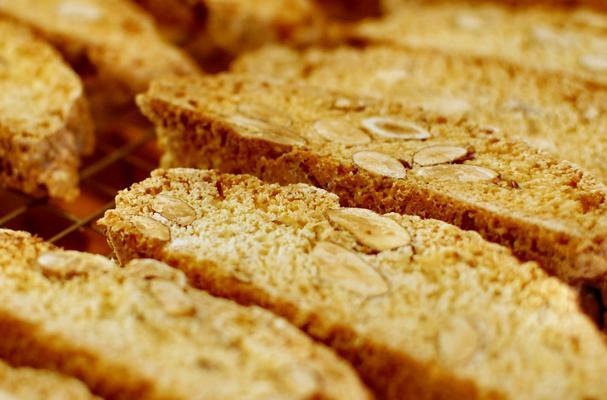 Our family loves almond biscotti, but at $13.50 per pound at our local bakery, it is an indulgence to buy. This recipe costs approximately about $5.00 and makes about 2 pounds of biscotti. Years ago, I tried making biscotti and it was a disaster, so I was afraid to try them again. Recently, I tried this recipe with fabulous results! Easy, fast and better than a bakery. So good in fact, I had to stop at Trader Joe's to buy more almonds this morning to make my third batch in two weeks. I can't seem to make enough!